Ever since I was a teenager I have been in awe of the old Jeeps my neighbor’s Dad (Mr. Thompson) and his friend Jay had. They used to take us out wheelin’ in Deep Creek and old Pilot Rock Road. Flash forward some 30+ years and I finally got one of my own. It wasn’t really in the cards per se, but thanks to an out of the box thinking salesman I got one. Toward the end of last year, I started looking at the new 4 door Jeeps, wishing I had one. One day, like December 28th, I decided to actually stop and look at a pretty black Sahara sitting at a dealership on Clearwater ( Clearwater Auto Plaza). I had been driving a 2000 Audi A4 for the past couple years and it was starting to cost some money to keep it on the road. My problem was to get it in trade-in condition was gonna cost $2000 – $6000 depending on who did the work and where I got the parts. Anyway I was well into it (about $2100) and had only the ABS brake computer module to replace and basically had enough and really started thinking about that Jeep. When I stopped by, Rueben, the Salesman told us the price and ran some numbers coming in around $400/mo @ 12% interest. I walked telling him I was looking for something more like 5% and $325/mo. He said he’d look into it and we came home. I had sticker shock and looked really hard at my finances and came to the conclusion, that it just wasn’t gonna happen before I paid off my Harley, which I still owed about $3000, and decided to stay on track repairing and Driving the Audi, then ramping up the payments on it and maybe be clear for a Jeep in Feb 2013. I’m planning to retire in 2018 or 2019 and want whatever I buy to be paid for by then. The next day Rueben calls with news that he got me down to the number I had requested. I told him about my research and that it was a dead end. Because I really couldn’t buy the Jeep until I at least got my Harley paid for in August. He asked what I owed as there was a little room in the Jeeps value vs. the price we agreed upon. Then he said what if we paid off your Harley in the purchase? BRILLIANT! Crap, now what do I do? Long story short it was a no brainer I get the Jeep, paid off the Harley and unloaded the Audi in one fell swoop. 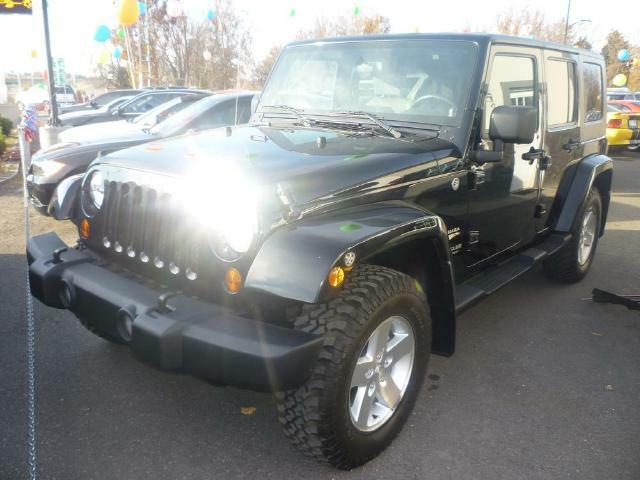 So thanks to the out of the box thinking of Rueben Esparza at Clearwater Auto Plaza I have a (new to me) 2007 shiny black Jeep Wrangler Sahara 4 door. So if you’re looking for a new vehicle talk to Rueben! Yay for me!